Rivets come as two pieces that snap together to hold 2-3 layers of chipboard. A great way to utilize this new feature is creating custom dials. To create a dial, begin by downloading the printing template of the desired slug size. The ideal hole size for the new rivets is 0.31". This provides a snug fit that allows the layers of chipboard to spin, but not so freely as they will slip out of place. 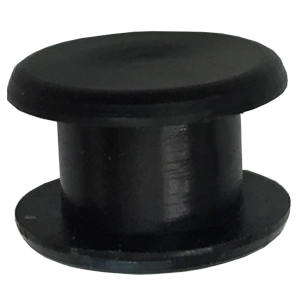 Here is an example of a dial that fits on a medium slug. Each piece has a 0.31" hole for the rivet to fit. When designing a dial, consider how many numbers you will want to fit on a single dial. 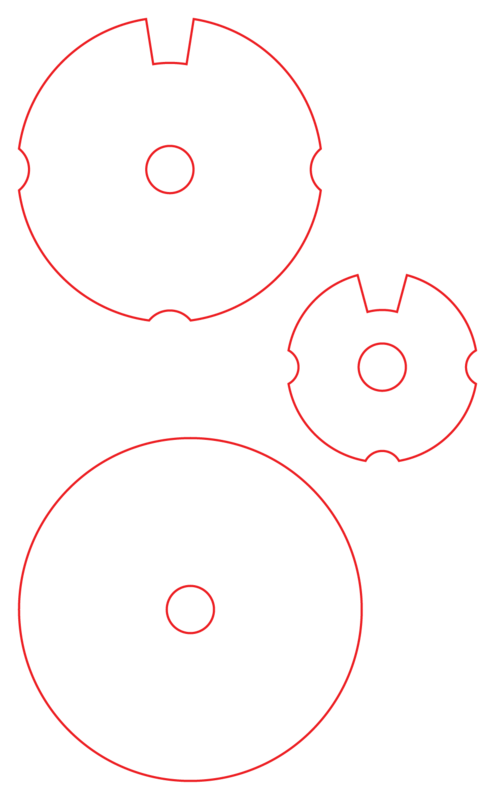 This is an example of a 3 piece dial that allows for tracking two numbers simultaneously. 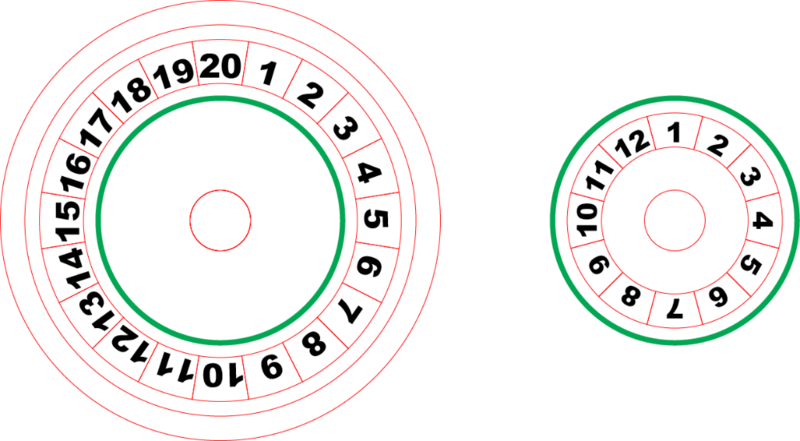 The small dial has been designed to fit within the numbers of the larger dial so as not to block the other dial's numbers. The pieces that will cover the numbers are outlined in blue. The small and medium size pieces have windows that allow for the numbers on the lower piece to show through. Note how the size of the space allotted for each number affects the size of the window. 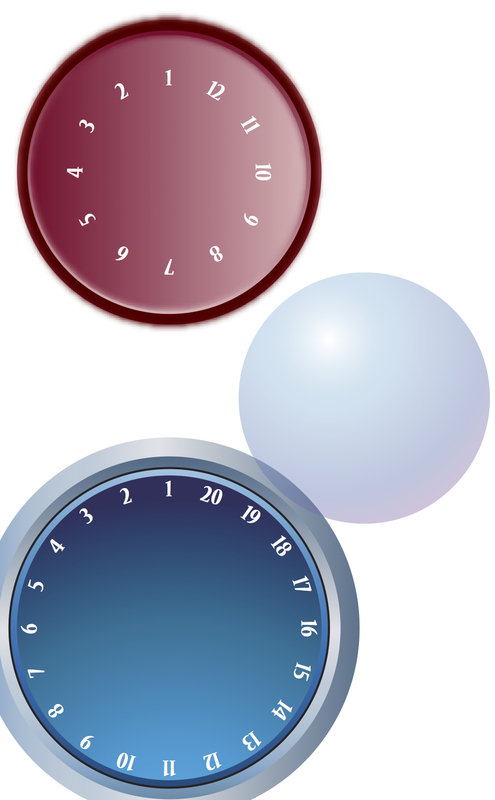 Here are the three pieces that make a complete dial that can track two numbers. Notice how the above design has notches on the sides of two of the pieces. These allow for easier grip and turning of the dial. 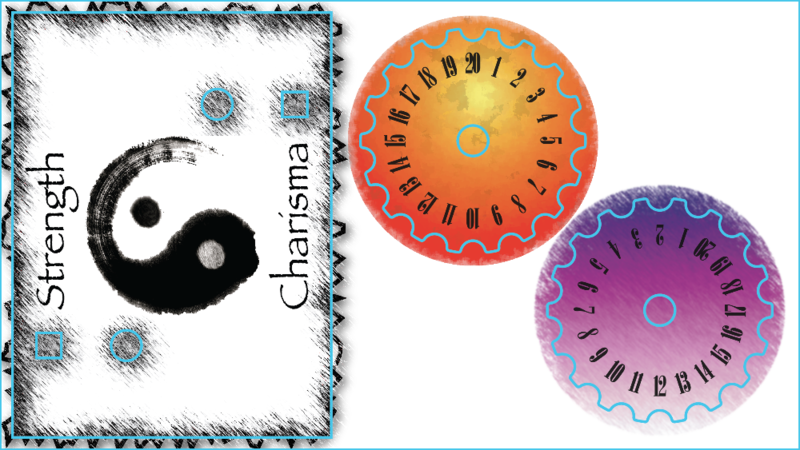 These should be considered in the final art design so that the notches do not reveal numbers of the layer below. 3 layers of chipboard fit snuggly in the rivet. A 2-piece dial will turn smoother and more loosely than a 3-piece dial. Making the rivet hole 0.32" rather than 0.31" will yield a dial that spins more freely. With a 3-piece dial, the rivet can be pinched slightly more to constrict spinning, as well. Number sequencing: Here is a tile that has two dials inset with two rivets. The light blue line represents the cut lines. 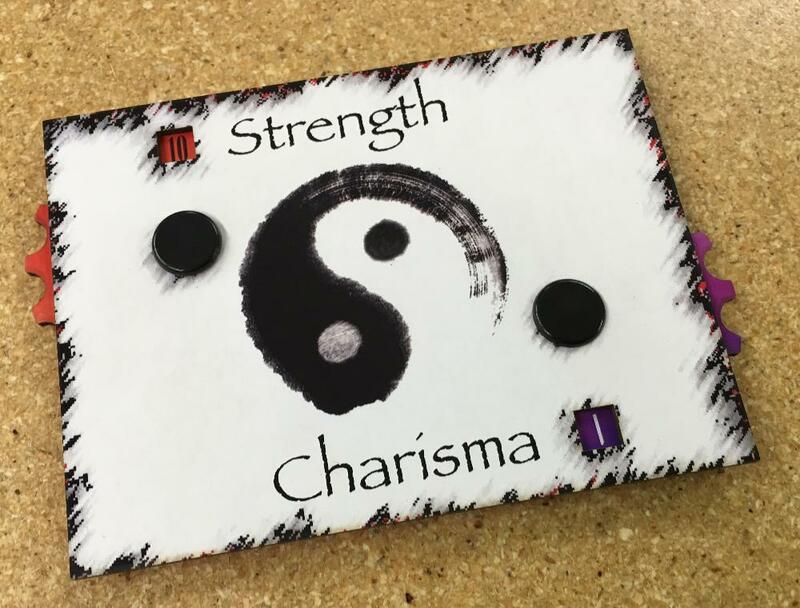 The orange dial for "Strength" and the purple dial for "Charisma". Notice the placement of the windows for the corresponding dial. The orientation of the numbers depends on the window placement. If the window is below the rivet, the numbers need to be upright at the bottom of the dial. If the window is directly above the rivet, the numbers should be upright at the top of the dial. When sequencing numbers, consider how the dial will be held and which direction will feel natural to turn the dial. 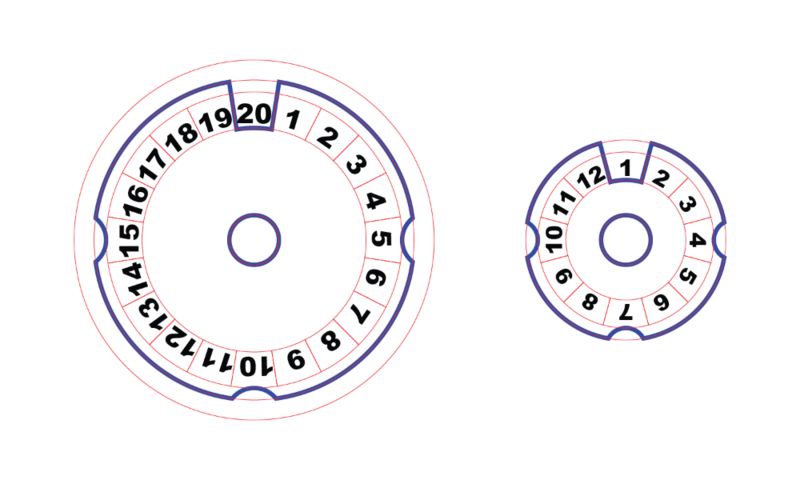 See how the red "Strength" dial would be turned down with a left hand, counter-clockwise, where the purple dial would likely be turned down with a right hand, clockwise. The numbers are sequenced accordingly.